Keeping up with your turf upkeep is important, as it can affect its playability and quality. Over time, your infill may be moved around due to people tracking it from place to place to rain causing displacement. When the infill moves around, your grass will appear misshapen and downtrodden, giving in to the pressure of constant use. Displaced infill can affect the hardness of your field and lead to injuries from falls. Having your infill regularly checked and replaced can help extend the lifespan and functionality of your new field. Your infill helps weigh your turf down, giving it a more natural appearance throughout the year. As temperatures change, the turf will expand and shrink in tune with the climate, and infill masks it from being obvious. Rubber infill keeps your grass standing straight, regardless of foot traffic, and adds a layer of protection to your absorption layer underneath. How Often Should I Have My Infill Checked? 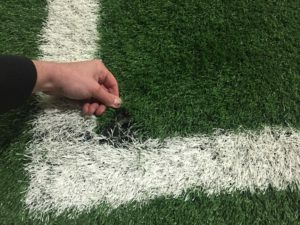 We recommend having your synthetic turf field routinely checked to make sure it is performing at its peak. At Turf Prep, we offer annual maintenance plans that involve six on-site visits to check your artificial grass. In addition to performing safety tests, seam inspections and examinations for general wear, our team will measure the total depth of your infill and add where more where appropriate, migrating excess rubber that has been moved around. Turf Prep will visit your facility three times in the spring and three times in the fall to keep your turf safe during peak playing season. If you are interested in keeping your synthetic turf even and well-maintained, contact Turf Prep today! We will make sure your grass is pristine and game-ready all year. To schedule an appointment, Turf Prep can be reached by calling 1-877-774-8873 or by filling out our online form.